In 2012, Patrick launched the Speaking Human podcast with his MONSTERS Communications Director, Shad Connelly. The idea behind the podcast was simple: eliminate industry jargon and mumbo jumbo to focus on the human side of marketing—highlighting all the amazing creativity, innovation, insight, humor, and joy that goes into creating and consuming marketing. I recently sat down with him in preparation for his workshop presentation for American Marketing Association Northeast Ohio’s Digital Shared Interest Group. His focus will be to discuss podcasting and its importance within a digital content marketing strategy. Chris: Hi Patrick. I really enjoy the topic of podcasting and I’ve been looking forward to this interview since the topic came my way. Patrick: Thanks Chris, I’m happy to talk with you too. Chris:Alright Patrick, I’d like to start with the connection between podcasting and content marketing. Why should we be podcasting as a content marketing strategy? Patrick: Well Chris, I’d say podcasting gives businesses, business professionals, or anyone really, the ability to reach unique audiences that they might not be able to in any other media channel. Chris: Good point, I’ve often thought about the value of podcasting in regards to the length and unfettered access to someone’s ears. I’ve felt this everytime I listen to a content marketing podcast. Patrick: Exactly. Podcasting connects with human beings on a totally different level. Audio is a very intimate media because your audience is visualizing the story/narrative you’re creating, which develops a more emotional cognitive connection with them. This is the ultimate goal of almost any brand or marketing initiative. Chris: I’ve only dabbled in podcasting myself, but I write blog content on the regular. Could you please share some tips on generating content for podcasts? Patrick: It is very similar to video, text or any other marketing initiative. You create a plan or strategy that outlines the goal, message, and who you’re trying to reach. Then, you produce an editorial or production calendar, script your show, and produce each episode. Chris: Any suggestions for how to promote or launch the content? Patrick: Like any other marketing initiative, I suggest you use any means available to announce it to the world. This includes any other channels you have at your disposal. Chris: How do you use podcasting to drive leads? 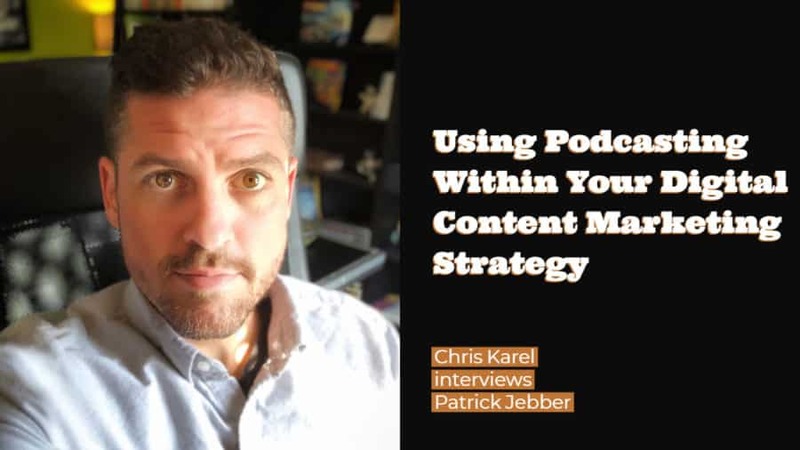 Patrick: I suggest making a podcast as a central component to your content marketing strategy, so it becomes the thematic hub for your regular distribution of marketing information in each calendar month. The podcast can then drive traffic to your website which houses a variety of types of content, including video and articles that engage visitors to stick around and learn more and be entertained. Chris: My next question leads to measurement. Once you’ve driven people to your site, how do you measure success? Patrick: I always start by asking–what is the goal you want to achieve with your marketing initiative? Everyone has a different definition of success. Chris: No doubt. Let me clarify a bit. How do you suggest that people measure the success of a podcast? Patrick: The reality is that podcasting can take time to build a listener base. But like any other medium, building an audience and their overall engagement will be the ultimate measure of success. For example, are you seeing an increase in listeners over time? Hopefully the answer is yes. What are the type of engagements you’re looking for and are listeners a part of that brand interaction? This is an important question and part of the equation that helps you identify how you can get people engaged with your podcast. Some podcasts ask listeners to interact with them through their website, Twitter, etc. The question is—what makes the most sense for your podcast and your brand? Chris: Thanks for those suggestions Patrick. I’d like to end with some words of advice. Patrick: Sure Chris. I’d suggest that people avoid doing too much too fast. I often tell people to be realistic when approaching the topic of any content marketing strategy. The worst thing you can do is create unrealistic expectations and then not follow through with them. You want to create consistency and build a certain trust with your audience so they know what to expect from you and your brand. Like all marketing endeavors, this is crucial. Chris: Thanks Patrick! I appreciate your time and I look forward to your workshop. Please join Patrick and I at the Digital Marketing Special Interest Group on Tuesday, February 5, 2019 at 7:30 a.m. in Independence, Ohio. Click this link to reserve a free ticket if you are an AMA member or purchase a $10 ticket for non-members. See you there. For more information about upcoming Digital SIGs, visit amaneo.org/events.